Knitting, crochet and whimsical jewelry! Announcement A wide selection of knitted and crocheted accessories and some whimsical jewelry pieces... neckwarmers, scarves and scarflettes, wraps, capelets and shrugs but even rings, bracelets and necklaces are all handmade with great care and love. My creations are all limited edition or one of a kind but please don't be shy about asking if a sold item can be re made... sometimes it is possible to make a similar one... custom orders are always welcome! Please refer to my Shop Policies for important informations on payment, shipping, returns, custom orders and more. A wide selection of knitted and crocheted accessories and some whimsical jewelry pieces... neckwarmers, scarves and scarflettes, wraps, capelets and shrugs but even rings, bracelets and necklaces are all handmade with great care and love. 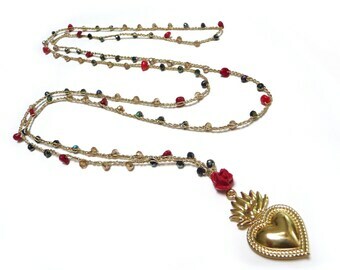 Dai colori tenui, la collana è delicata e perfetta in ogni dettaglio. Consiglio sicuramente di acquistare le sue creazioni. 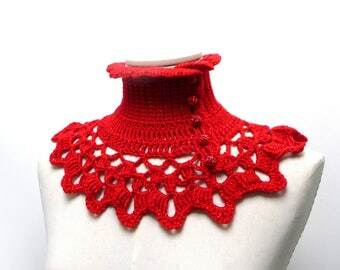 A lovely friend gifted to me this wonderful illustration of my red Ninu’ collar neckwarmer... I love ️ so much all this victorian flavour!!! Even bad girls sometimes can be trendy! Introducing my new “Frida” neckwarmer... a colorful and whimsical accessory, inspired by the famous mexican artist Frida Kahlo! One of my little creative spaces in my lovely house under the roof! 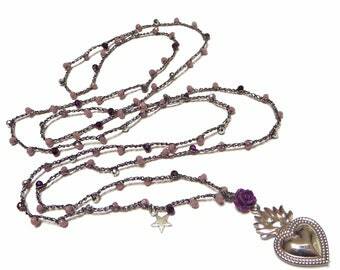 I love to improve every piece I create with a whimsical touch! I am an architect and my first job is planning and interior design, but my real passions, since I was a little child, are women's accessories and jewelry, expecially every kind of outlandish and sparkling ones. If you see any of my designs you like, but would like them in another colour or would like me to design something special for you, please let me know!